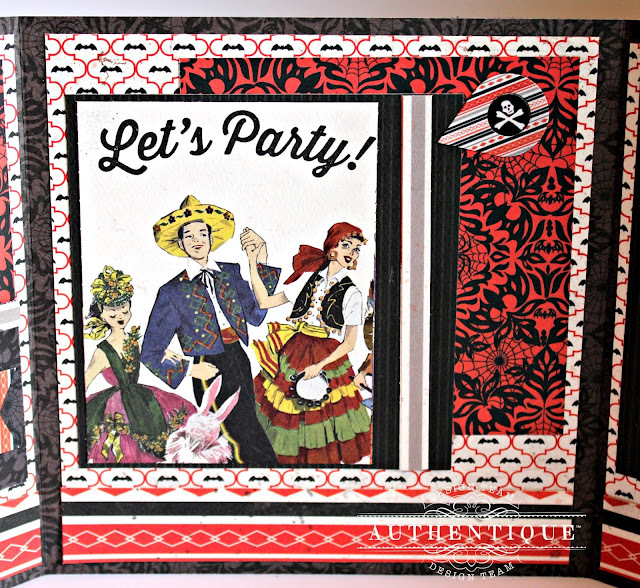 Authentique Paper is one of the hottest brands in the paper craft industry! Our style is vintage with a modern twist and our products are always made with the crafter of all levels in mind! Authentique Paper is proudly 100% made in the USA, from start to finish! Hello My Pretties! 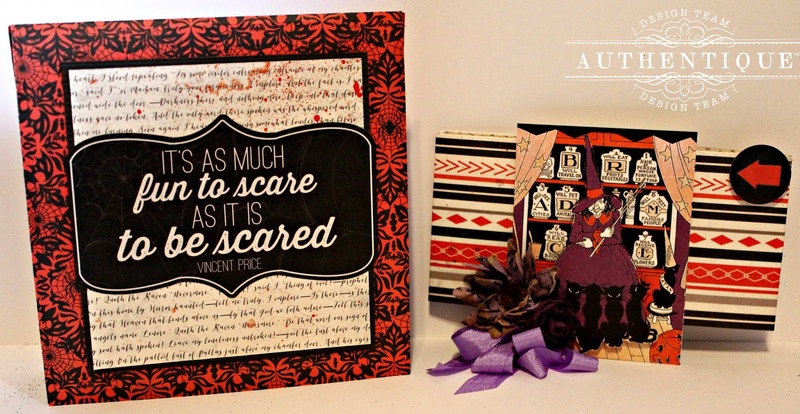 Are you ready to make some special Halloween invitations and other fun Halloween treats! Today I am sharing an easy but unique Halloween Party Invitation with tutorial. 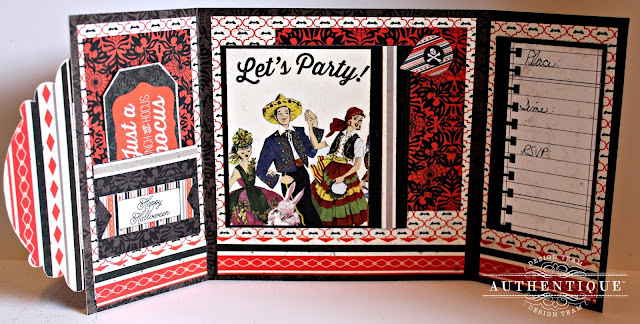 Remember though the style of card can be incorporated for any of your upcoming invitation. Photo 1: Cut one sheet of the pattern paper from the Bewitched Collection Kit in half to measure 6' x 12"; score the first half at the 6" mark. Fold at score line. Photo 2: Score the second half of the sheet at the 3" and 9" marks. Fold at score line. Photo 3: Adhere the second scored piece into the bottom part of the first scored piece to form card. 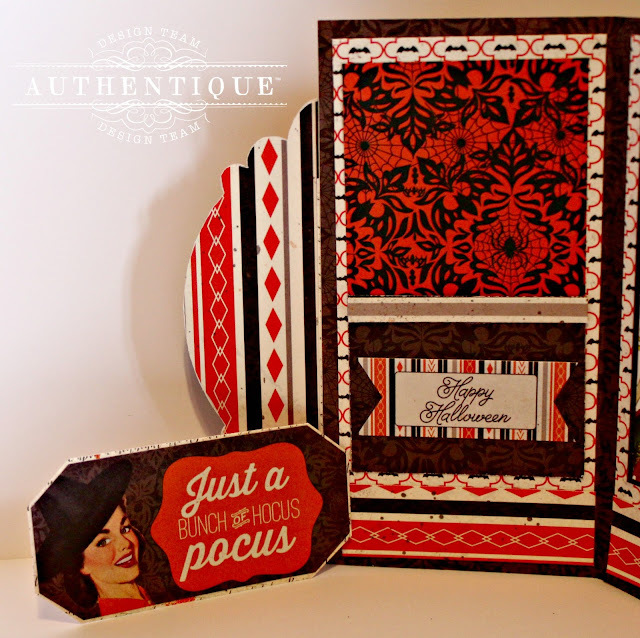 Decorate the inside of card with Bewitched pattern papers and strip borders. On the left side form a pocket with Bewitched paper. Add sticker to top of pattern paper; adhere magnet to back of sticker. Add "Happy Halloween" sticker to front of pocket. Add one of the Bewitched Eight 3x4 cards to top of inside of card. 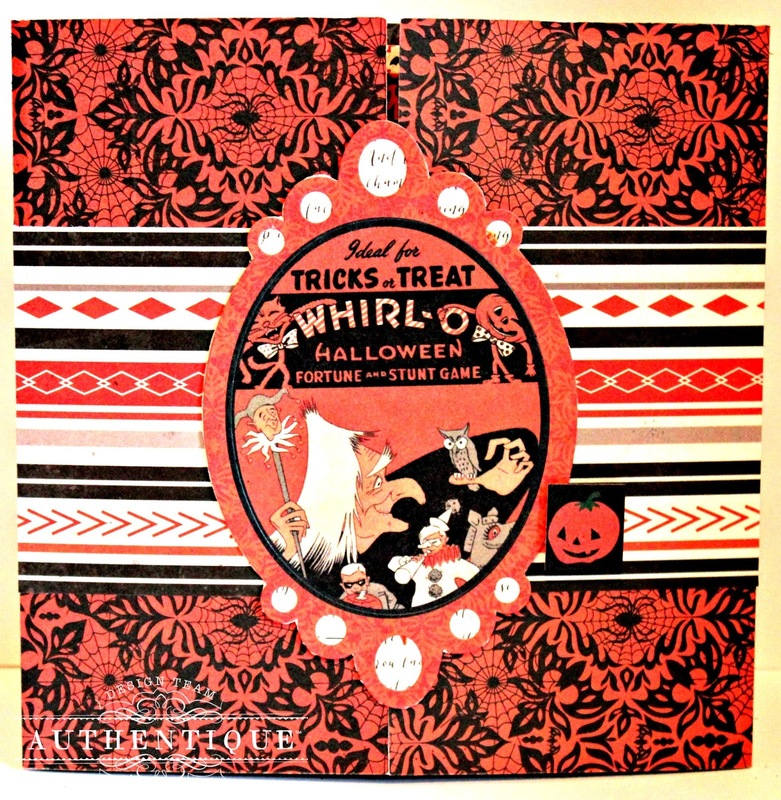 Create "invite" by border punching the back side of a piece of the Bewitched Eight paper. Adhere to inside of right flap. Fold flaps closed when decorated. Adhere 3" strip of pattern paper to flaps of card. Add sticker to top of Bewitched pattern paper; fussy cut around. Adhere to left side flap of card. Add sticker to right side flap with pop dots to hold the card flaps closed. 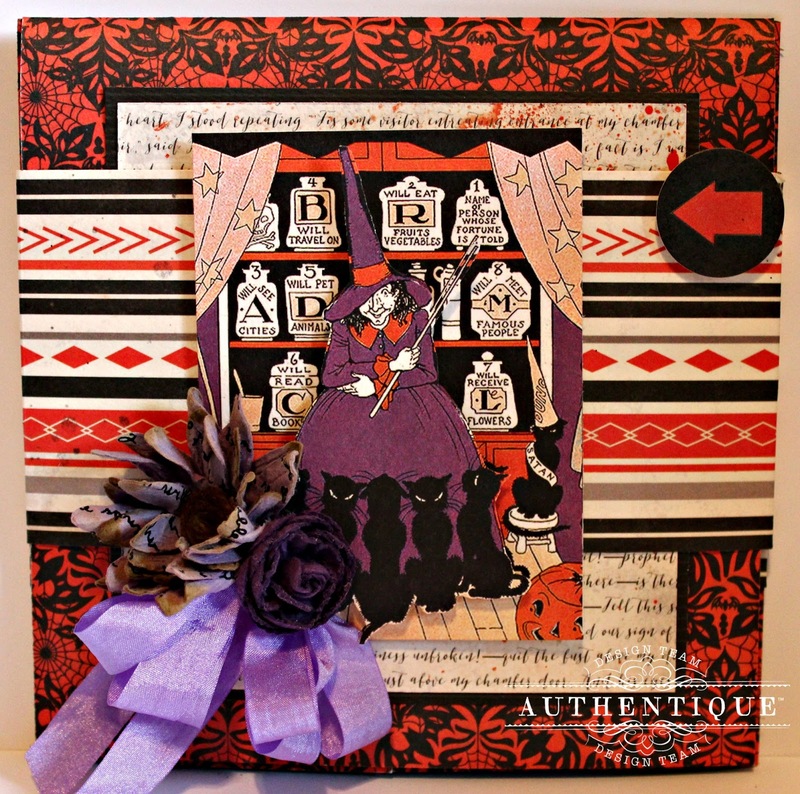 Fold top of card over decorated card; decorate top of card with Bewitched pattern papers and sticker. Cut a belly band and score to fit around formed card. Wrap scored belly band around card; adhere together at back seem. Add one of the Bewitched Eight 3x4 cards to front of card; fussy cut second image and place on first with pop dots. 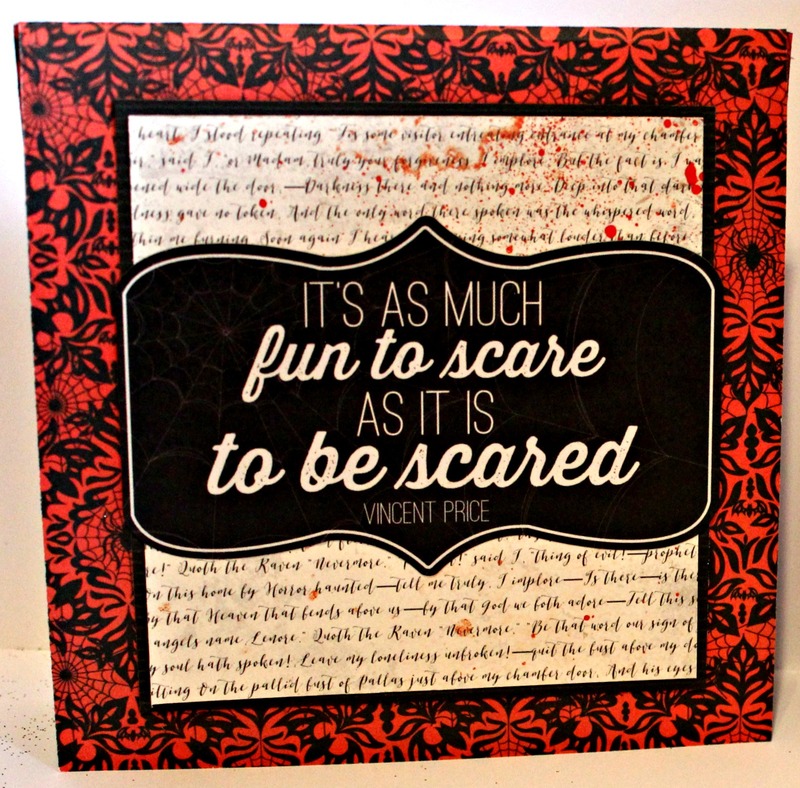 Add sticker to front of card front with pop dots. Finish invitation with a few flowers and bow. This is so very clever and fun! Such gorgeous papers!